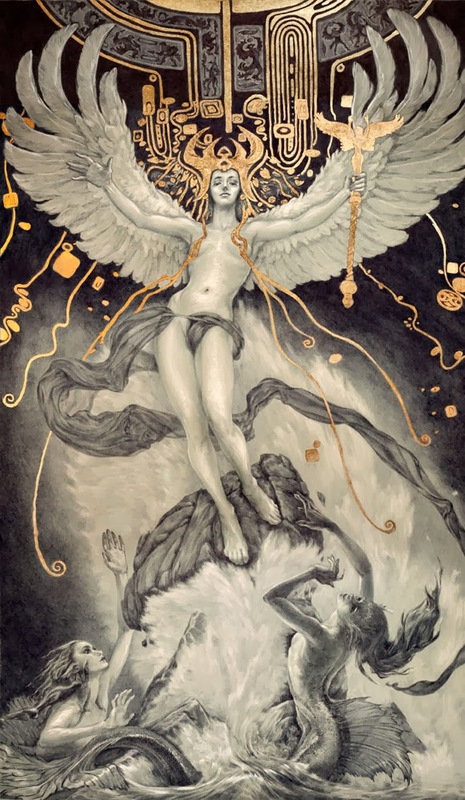 Toronto-based artist Rebecca Yanovskaya recently completed the second piece in her Winged series of ballpoint pen and gold leaf drawings on Moleskine. Called Descent of Man, the bowing angel took the artist about two weeks to fully create. It's the sequel to the first piece shown below called Ascent of Man and the Destruction of Magic. The artist was inspired to create the series after a trip to the Metropolitan Museum of Art. "Klimt, Mucha, Herbert Draper, Bouguereau, Waterhouse, Frazetta, and a sculpture called 'Mourning Victory' from the Melvin Memorial were all inspirations for this," she states.